Upon arrival into Arsenale by Alilaguna (boat service), approaching land we noticed our hotel ‘La Hotel Ca’ Formenta‘, and was pleased to find it situated so close to the boat stop. First impressions when we got off the Alilaguna: 1. This boat stop is impressive. 2. I’m in One Piece. 3. Wow. A 360° camera spin ensues. Our surroundings were truly breath-taking and to top it all of not a car in sight. 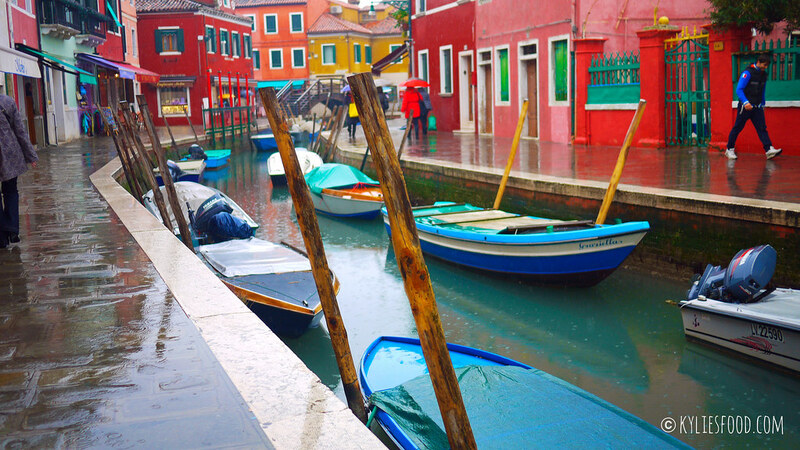 Our hotel was only 3-5mins away from the Arsenale station stop, this meant crossing two small bridges, which sounds like a trek but when put into context it’s not really – the main part of Venice is actually made up of 118 separate islands all joined together by these small bridges. Located on a street away from the hustle and bustle of tourists though within easy walking distance to San Marco square. The hotel was small but pleasant and the staff were really helpful plus friendly. They even presented me with flowers on the morning we left as it was National Women’s Day! 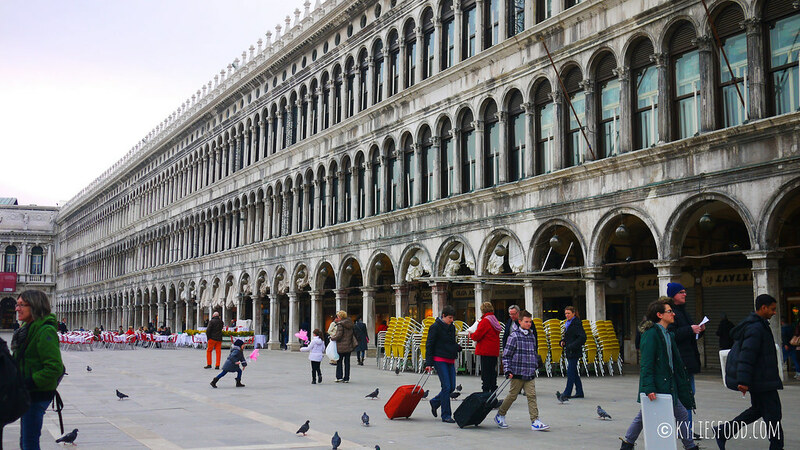 After dropping of our luggage at the hotel, we made our way to San Marco square which was a straight 10-15mins walking distance from the hotel – along the water front. Allowing you to take in the scenic views of the lagoon and the glorious architecture on your right, of what once was one of Europe’s wealthiest city in the 13th – 17th century. But that would be a whole history lesson in itself. On approach to San Marco square from this direction, you will pass the Doge’s Palace on your right, before walking a few inches to be greeted by the most grandest church I have ever seen – St Mark’s Basilica. Covered in colourful abalone marble complete with so much architectural intricacy and detail, this was art, clearly displaying Venice’s status, culture and skill at a forgotten time in history. Now much overshadowed by the romanticized tourist attraction it is known for today. The Basilica has changed greatly overtime with each century adding its own touches to what we see today, with items such as pillars, friezes bought from all over the Roman Empire’s rule. San Marco square is reminiscent to Trafalgar square in London without the fountains, and filled with our lost pigeons and tourists. The square wasn’t as impressive as it would be in the summer, where you’ll see the cafes bustling with outdoor seating, adding to the atmosphere. The square was also plagued with construction works at the time we visited. This may be due to the flooding that occurs during the autumn and winter, this is a waterlogged sinking city after all. 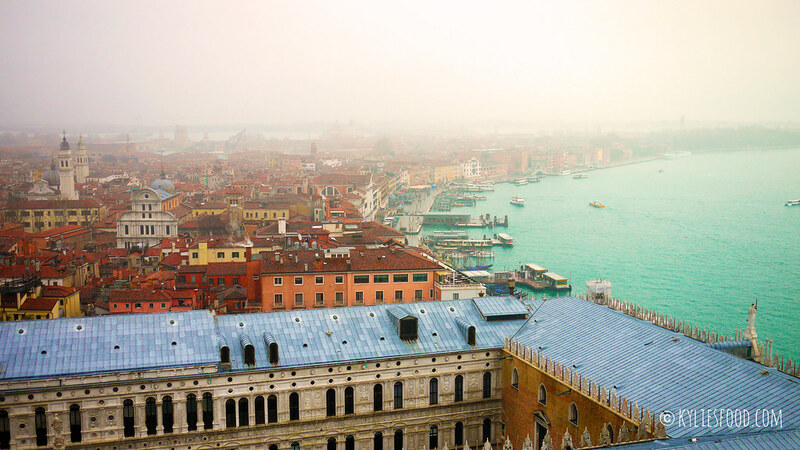 The Campanile (St Mark’s Bell Tower) was too undergoing construction, due to the deterioration of the base of the tower, however you were still allowed to enter, where you can take a lift to the top of the tower for 8€ and oversee the city. 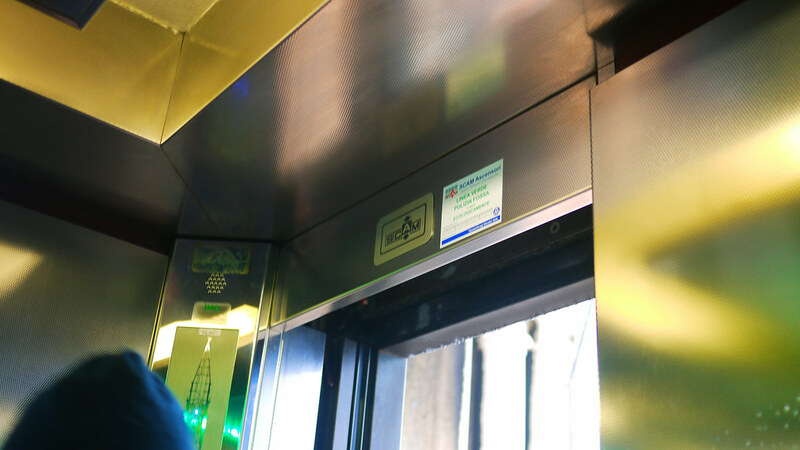 When we entered the crammed lift we were greeted with a sign which read – SCAM. Was this all just a tourist trap? Yes, of course it was. 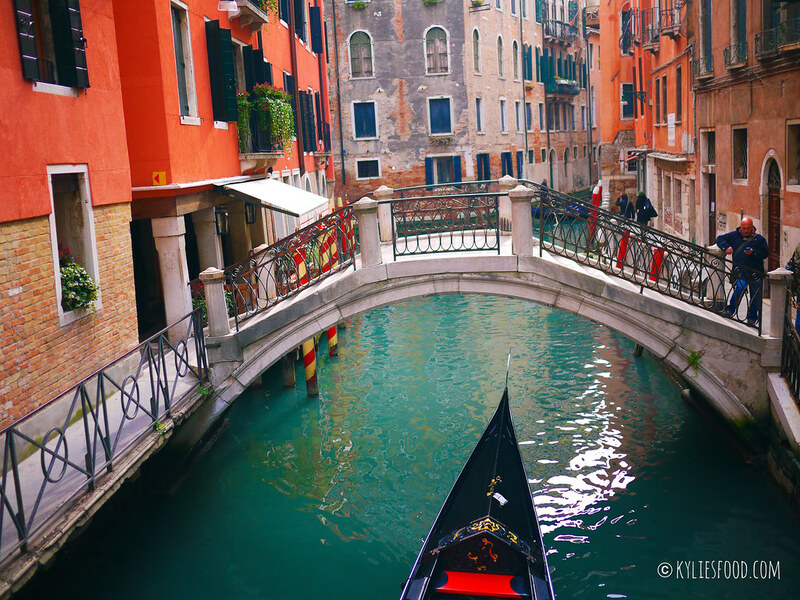 Next stop, the Rialto Bridge! 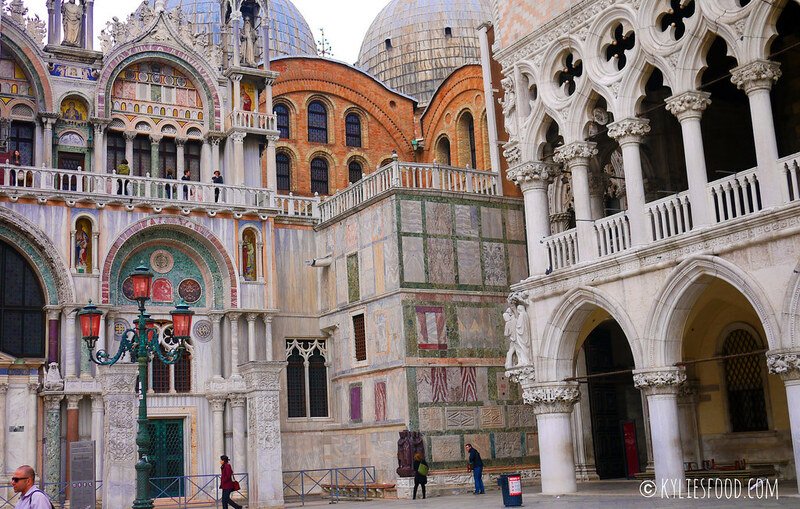 This was only a short 10-15 minutes walk away from San Marco Square – just follow the ‘Per – Rialto’ street signs. Here you stand against the bridge staring hollowly towards the lagoon, for a dramatic photo opportunity. I forgot to get an instagram version. You can catch some good sunrises and sunsets from here. 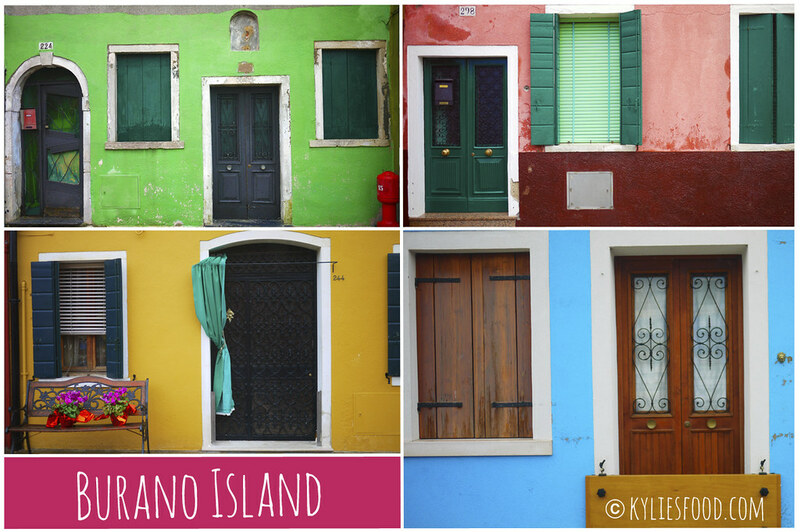 Burano was the only other island along the lagoon that we visited, an island known for it’s picturesque brightly painted coloured houses and artisan lace production. It’s a mystery as to why the houses are all painted in different colours and many theorists still debate about this today. Everything looked closed at the time, though this may be due to the downpour of the rain. 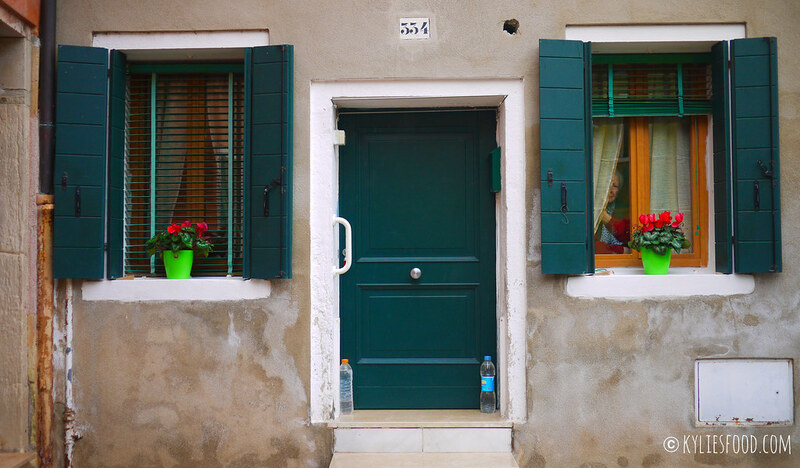 Regardless, Burano is generally a quiet rustic little town, in contrast to the vividly coloured buildings, which some have described the combination of the two gives the island an eerie feeling. I found the island to be quite peaceful, there wasn’t someone trying to sell me something at every corner like mainland Venice and there were only a handful of tourists. We didn’t spend much time here as it poured down with rain and shelter was scarce on this tiny island. This lady was peeping through her window as we passed and gave us a wave….or a shoo. Rain rain rain won’t stop us! 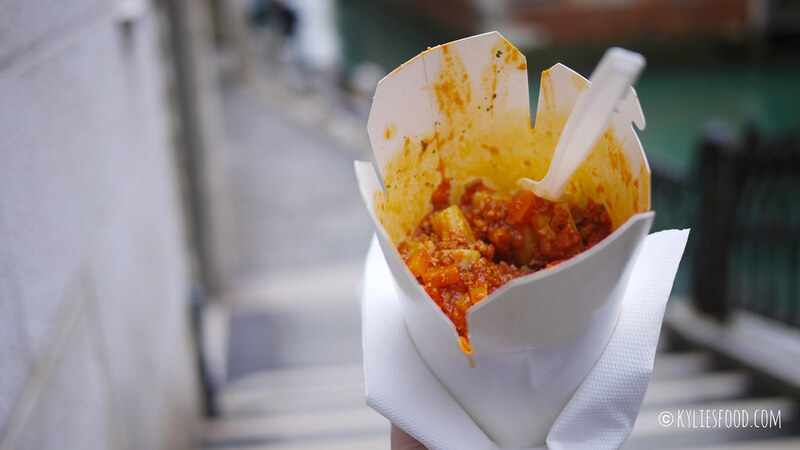 The food in Venice is something of a mystery to me, maybe because I was a tourist and visited all the top listed things to do according to Tripadvisor. A big mistake I will avoid next time. The food I had left me very underwhelmed and what can only be described as – meh, and sometimes no. I came to Venice expecting the fine foods of Italy instead I often got bad coffee made with unclean machinery, completely tainting an espresso or cappuccino with a notable rancid taste, very bland tiramisu with not much liqueur or coffee – taste only of cream and coco powder (tiramisu literally means ‘pick me up’), and okay pasta from the no.1 listed place to visit on Tripadvisor. We even tried tiramisu and coffee at different cafes and patisseries only to be left disappointed one after the other. 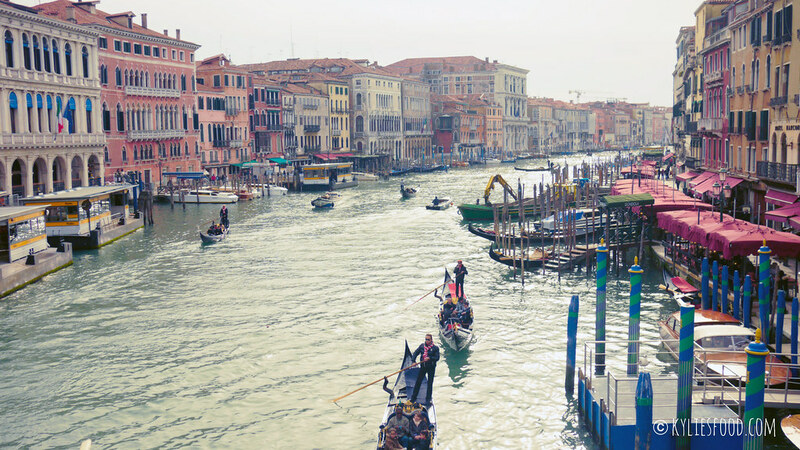 You’d be surprised how hard it was to find good coffee in Venice. The best places we visited were ones which we had not looked up before hand, maybe because we had no expectations to be ruined! One thing you might do in Venice is stand whilst you eat a light snack, because in Venice they charge you a lot more for your coffee and cake or spritz and pizza if you chose to sit down. You’ll notice a lot of the locals scoffing down pizzas or cakes standing and taking their drinks at the counter, much like a bar. Maybe they don’t like to sit as this wastes time, and time is money. 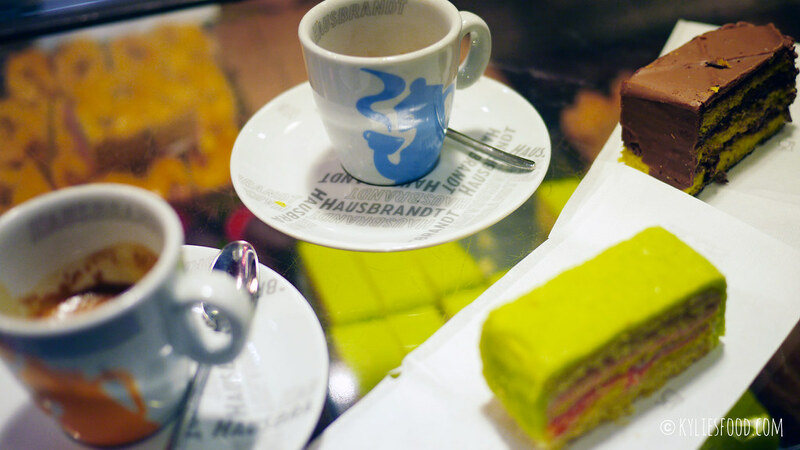 Marchini Time cafe was probably the best place we visited for cakes and coffee. The espresso was rich and didn’t have a strange stale equipment taste to it. The cake was pretty decent; we ordered an orange marzipan and lemon marzipan layered cake. And all this for a very reasonable 5€. 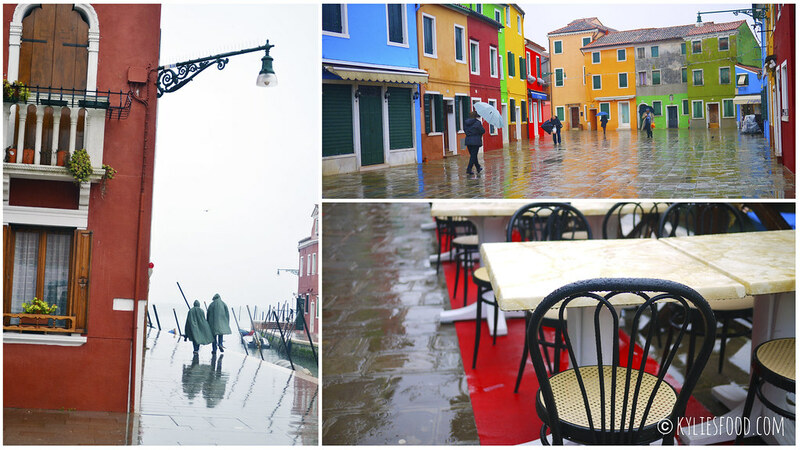 We went in here by chance to shelter from the rain and a quick warm up whilst waiting for our boat, at Fondamenta Nove (Ft Nove) to take us back to Venice from our Burano visit. The cafe was directly opposite the boat station stop. We ordered a spritz with Campari and a cappuccino, both drinks went down a treat. Before we got our drinks, the waiter asked us if we wanted to sit down with a hesitate look as to say you will get ripped off if you do, so we didn’t and stood by the bar like many others. They also serve food here from light deli snacks to hearty pasta meals. But as we were expecting our boat we finished our drinks hastily and hopped on our boat back to Arsenale. A small local restaurant recommended by our hotel conveniently located on the same street as our hotel. This appears to be a place where locals as well as tourists go to enjoy dinner. As we were on a budget we ordered the tourist menu, this consisted of a starter and main with a side of vegetables for 15€. 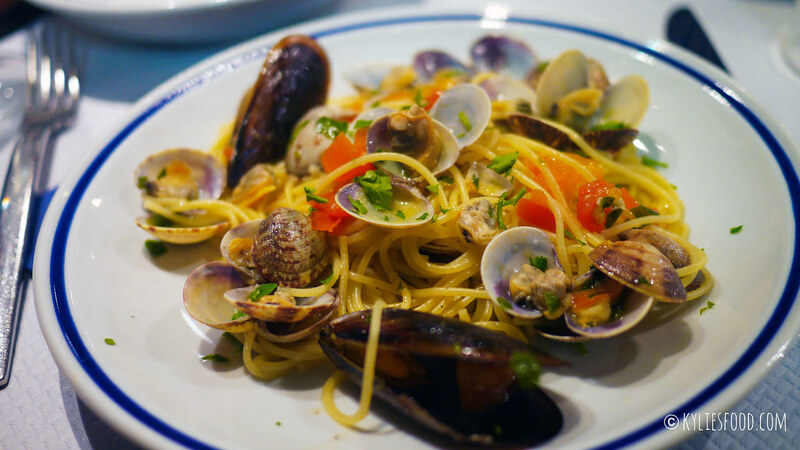 For the first course (primo) we ordered the clam spaghetti, a lovely dish cooked beautifully, with all the flavours of white wine, parsley, olive oil, fresh clams lively and bright. For the main (secondo) we ordered the mixed seafood with salad. This was lightly battered squid and sardines served with a side of polenta. The lightly battered squid was pleasant and reminded me of dimsum’s salt and chili squid minus the salt and chili. The sardines tasted like sardines, complete with the minuscule bones that could choke me any moment I wasn’t careful enough, but the taste was fine. A very lovely visit, service was friendly and genuine. This local pizza place was found using Tripadvisor, a small ‘chippy’ like shop but for Italian pizza, it was a very popular spot amongst students. We could have sworn we saw an Italian version of Ann Hathaway eating pizza here whilst surly staring at us foreigners. A pizza slice would set you back a modest 2€ and it was a giant slice at that. We decided to get a whole small pizza for 6€ and foolishly commute back to our hotel, in the pouring rain, holding a hot pizza box in one hand, a brolly in the other and watched the box turn soggy as we got back. The pizza was unharmed, though cold now, it still tasted great. We got the Capricciosa – ham, artichokes, mushrooms, olives. Ranked number 1 on Tripadvisor of course we had to hunt this place down and see what all the hype was about. Like much hyped up places, expectations build dramatically. And like most, this place didn’t live up to the hype. People sang so much praise about this place on Tripadvisor; we thought we’d be in tears as we ate the pasta. Yes the pasta wasn’t bad, but it wasn’t mind-blowing to be number 1 on Tripadvisor. Having said that the place was very busy and we had to wait a good 15-20 minutes for our pasta as each box is prepared and cooked on order, by two chefs behind a tiny kitchen. This may have contributed towards the quality of the meals we were served, as the pasta was slightly under done, only slightly. Still the bolognese was pretty average, maybe get the carbonara next time! It was probably the down to earth service which people loved about this place, and the soulful food which was really hard to find here, if you wasn’t recommended a place by someone who knew their stuff. We also ordered the black squid ink spaghetti, again it wasn’t special, but it was funny to see the reactions we got in the street (we ate outside as Alfredo’s is tiny and more of a takeaway joint) as our lips were stained black from the ink – going for that gothic look. I know what you’re thinking, but what about the Gelato? Sadly, the only place I tried was La Mela Verde out of the abundance of choice in Venice. Having just walked passed it whilst getting lost in the labyrinth of alley ways, we thought ‘ooo gelato!’. And I forgot to take a photo of it! This was the first eats we got once we landed in Venice, so my camera snap instincts didn’t quite kick in yet. The gelato was good but I can’t compare to others in Venice having not tried! We got the hazelnut-chocolate, green apple and coconut gelato flavours. This was one of the highlights of this trip, if you ever go to Venice I’d highly recommend you check this place out. The Venice Jazz Club is a small club serving meals such as lasagne and pasta, but it doesn’t class itself as a restaurant. 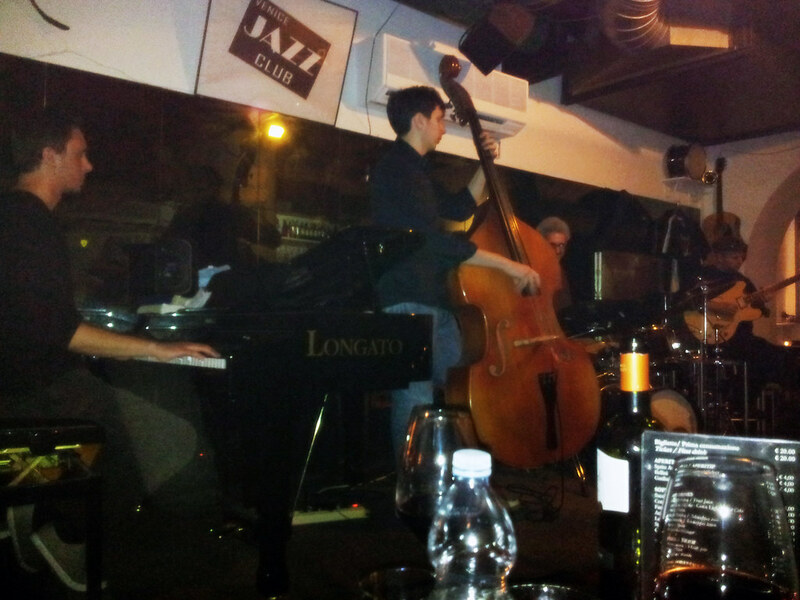 The main appeal is the music performed by their very own in-house jazz band, and when I say in-house I mean it. Our waiter Federico who took our orders was the lead in the band, the host and the pianist (imagine Jools Holland serving you lasagne). Music starts from 9pm – 11pm but you can dine and enjoy a tipple or two from 7pm before the gig starts. For 30€ per person we got lasagne with a side of salad, a bottle of wine and tickets for the show. To be honest I did not expect much when entering the well hidden club, but the music was beautiful, and changed my mind about Venice. It was great to see the musicians which consisted of a piano, guitar, cello and drums vibing together and showcasing their improv skills during solos – truly captivating. I felt like I was getting a lesson in jazz music right before my very eyes. Federico was an amusing host, and gave a little introduction about each song before they performed. To me this showed the real side of Venice, away from the tourist facade (although all the customers here were tourists) and gondola rides, away from the bad tiramisus and coffee, Venice’s beauty was in it’s art and it is displayed all over the city. 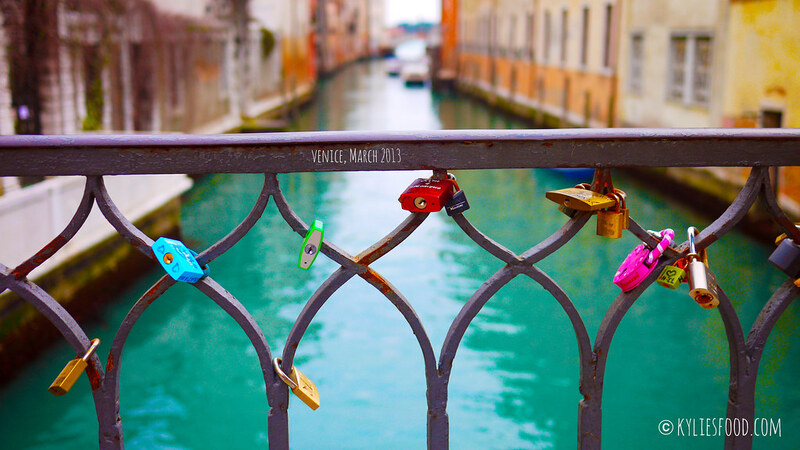 I remembered why I always wanted to visit Venice, it wasn’t for the food but for the beauty of the cities settings. I just needed to open my eyes and my ears helped me do that! Thank you jazz!